So my first final exam (in German) is tomorrow – Biopharmazie. It’s going to be two hours long, starting at 12. However, we also have class from 10:30-11:45, so grabbing lunch at the Mensa is going to be out of the question. In fact, there probably isn’t even enough time to get something from the Edeka and eat it. So what’s a girl to do? Pack a bento, of course! So instead of utilising my final precious hours before the exam by studying, I decided to spend about an hour preparing a bento. I’ve been thinking about preparing one for a while now, but have never had a reason to bring lunch – until now. 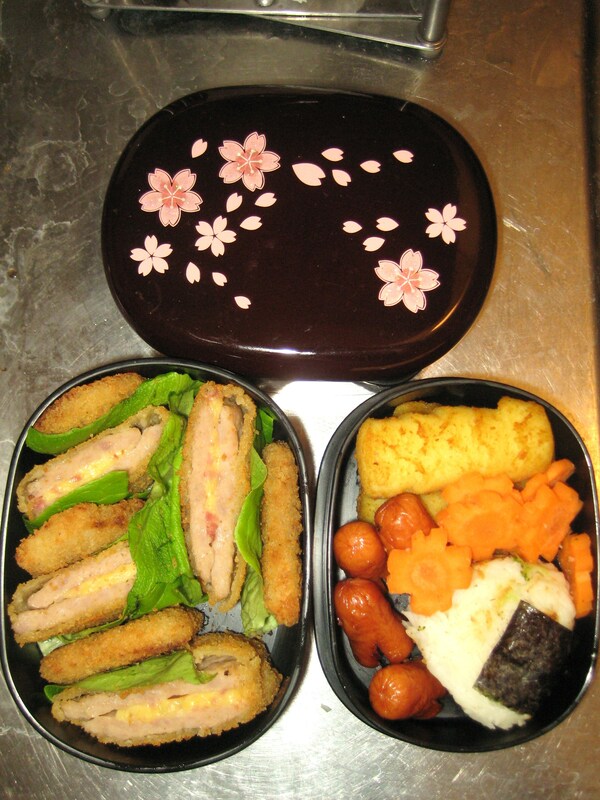 With a bento (actually “bentou”), the most time consuming thing is actually planning what you’re going to put into it, and arranging it. Since I really am supposed to be studying, I thought I’d keep it simple (no cute faces or anything on my onigiri…). I went to Rewe and found quite possibly the most perfect thing to put in my lunch – mini Schnitzel and Cordon Bleu. I know – what am I doing adding German food to my bento?! – but I AM in Germany, and it’s also MY bento. I also made tamagoyaki, which is rolled fried egg. It was easier to make than I thought, though I haven’t cut into it yet, so we’ll see tomorrow morning if it’s any good. Dissolve dashi broth powder and sugar in 50mL water. Add 4 eggs and beat until yolks are thoroughly mixed (but not frothy). In a hot non-stick pan (or a pan well-greased with oil), add just enough egg mixture to cover the pan. Let it cook, then push the cooked egg to one end of the pan. Add more egg, even less than last time, and tilt the pan to evenly distribute the egg. Cook, then roll the cooked egg mass (on the side) onto the new layer of egg and to the other side of the pan. Repeat until all the egg is cooked. Transfer onto a plate and let it cool. If you have a sushi mat, press the roll into a rectangular shape. Cool in the fridge, then slice! Here’s the excellent page that I learned the method from: tamagoyaki. 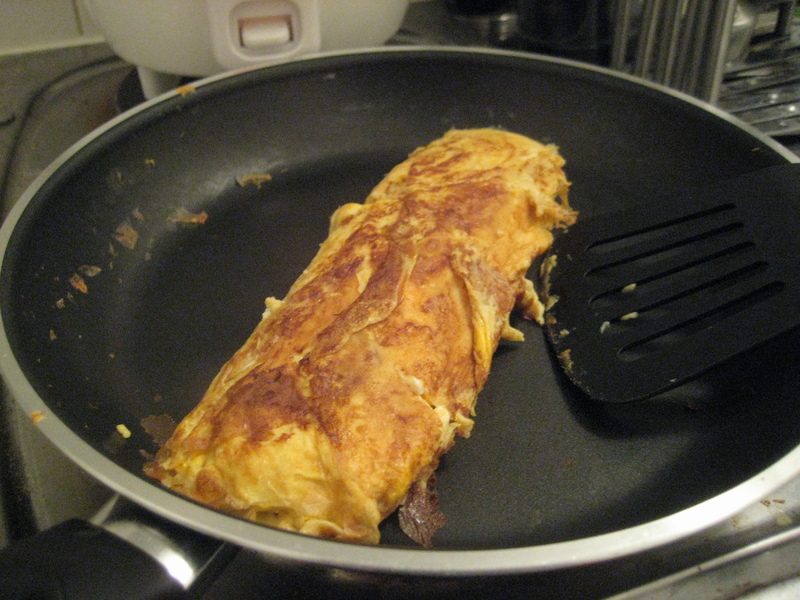 You don’t need a square pan to make tamagoyaki, though non-stick really makes things easier (and healthier). …and laid everything out for assembly. I cut the Schnitzels and Cordon Bleu in half, because they didn’t fit into the box very well whole. I added one lettuce leaf (actually ripped in half) between each piece, mainly for colour. That’s my first assembled bento! It’s not very elaborate or cute, but it’s definitely very filling. The schnitzel and cordon bleu are best fresh, as the coating is the most crisp then, so I’ll probably repeat it tomorrow morning, just before I have to bring it to school. 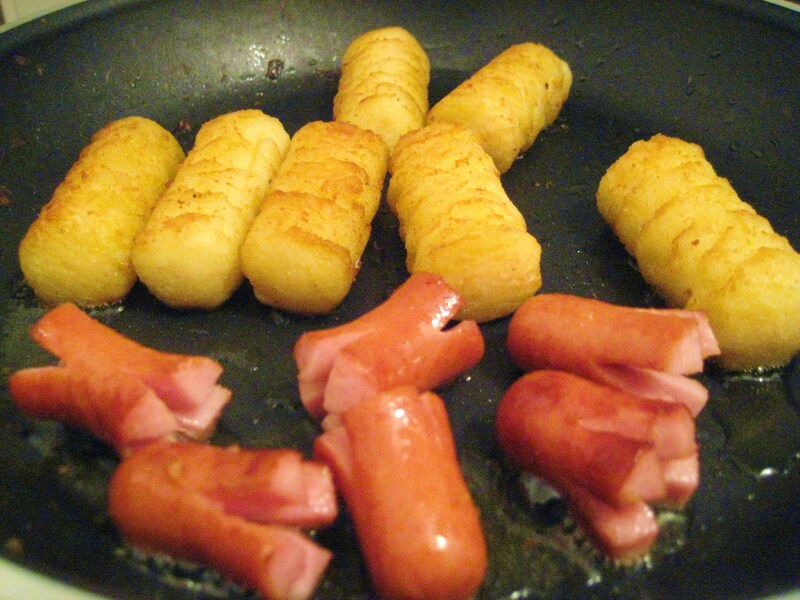 You might also notice I forgot to add the tamagoyaki – I’m thinking of making just cordon bleu (it stays more moist than the schnitzel), moving the krokketen into the bottom half, then putting the tamago slices into the top half. If I remember, I’ll add some broccoli to the top half, as well, for more colour and some nutrition. It didn’t take as long as I thought it would, but I can also imagine that it could take a long time, especially if you want to add faces or other cute things to it. All together, though, it was a pretty good meal (I had it for dinner). It’s too much for one person to eat by themselves, so I’ll be sure to share with my classmates tomorrow (we can pass it around under the table in class)! Oooh you could have put tiny eyes on your Wurstchen 🙂 And the tamagoyaki worked out. Sometimes I wish I had a bento box. But it takes too much time to prepare! ETA: Maybe next time you can put some Frikadelle or Fleishbällchen. That’s it. 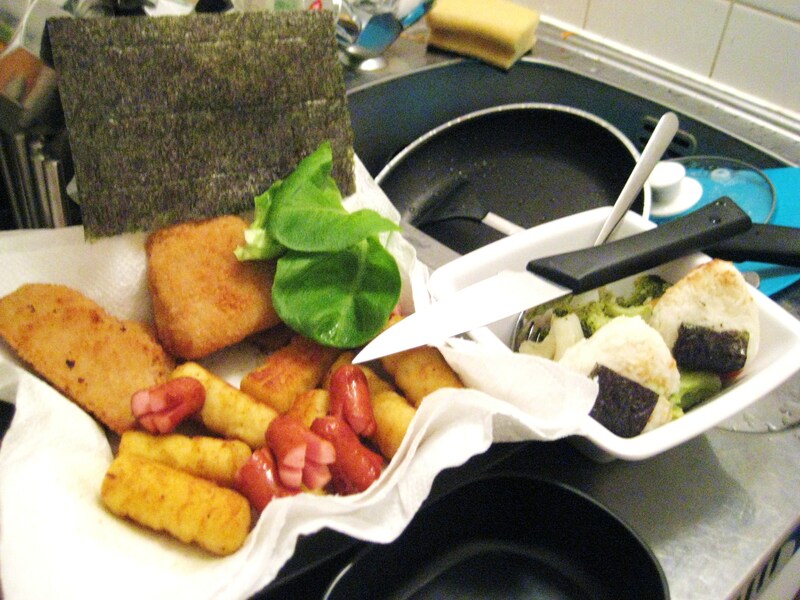 I’m going to get myself a nice, cheap bento box and make my own Flemish bento (read: fries and others). You have inspired meeeeeh! Oui: Mmmm, Flemish bento! I’m thinking of putting in Remoulade sauce…. These bento boxes are inspirational. That’s a lot of good food there. I wish I’m your classmate to enjoy some. I have to try to make these. They look so cute. That looks like a good lunch and should keep your tummy happy so that you can concentrate on your exam. All the best! this is making me rethink my baonan!